GOLD AND BLACK ILLUSTRATED VOLUME 28, ISSUE 6 44 this year), and I'm happy about that. I'm embracing the pressure and challenge that comes with that, but who doesn't want to be the guy? I'm taking that account- ability as best that I can." Purdue thinks Neal can be great, and maybe so — he finished with five-and-a-half tackles for loss and two sacks last season — but the defense needs more than one play- er in the middle of its line. Jones could be a Game 1 starter at the 3 technique, provided he's healthy after missing all but three games after tearing an ACL last season. Jones is undersized, at 6-2 but only 280 pounds, but has some veteran savvy, like he showed in extended work last season vs. Ohio. After those two, Purdue has "bodies" — that's how Brohm has described them — who will need to be productive in their snaps in an interior rotation. That group includes sophomore Anthony Watts and senior Ray Ellis, a former junior college transfer, along with redshirt freshman Allen Daniels and big-but-plod- ding junior Alex Criddle. There are equal questions on the edge, if not more so. Although he's not played at all, Reviere is a big, intriguing prospect, given that he's already 270 pounds as a redshirt freshman. During the spring, he showed flashes, being able to use his lower-body strength — he needed to make gains in upper-body during the summer — to hold the point on run plays his direction. Purdue might have used him during his freshman season, if for no other reason than to get him at least an ounce of experience, but he re-broke a foot before train- ing camp and was sidelined for a couple months. "I feel pretty confident, but I know for a fact that I'm not there yet," he said in June. "We still have a long summer ahead of us. I'm just going to take it day by day. I know for sure if I keep myself on the same pace I'm going on now, I should be able to make a big impact for the team this year." Purdue hopes to get the same out of Higgins at Leo, the pass-rushing hybrid that Ezechukwu played so well last season. 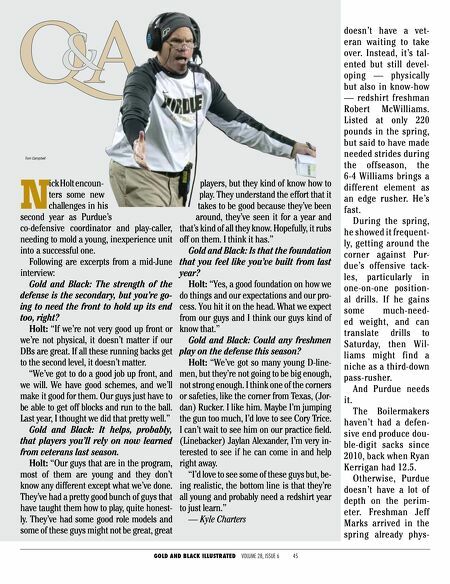 It was in the spring of '17 that Higgins held down the starting spot — Ezechukwu was still a linebacker then — and was deemed one of Purdue's most pleasant surprises. But the summer came, and Higgins didn't take a step forward, but rather rested, and he admits so now, on his spring success. Then, he didn't play much in the fall. But Higgins was recommitted this spring, taking back over the No. 1 spot and vowing not to let up. And ask most any defensive player about their hard- est-working teammate, and Higgins' name comes up among the first. Bailey sees it first-hand — the two were roommates this summer. "I've seen the off-the-field things that he's been doing," Bailey said. "He's been doing a great job with his nutrition and the body composition and the extra work he's been putting in. You can tell that he really wants to be good. That's encouraging to see." But if Higgins slips again this year, Purdue Tom Campbell Jacob Thieneman's versatility is important for the Boilermakers, and could be even more so this season, if they need to bring a safety down more frequently to play in the box.